Iraqi PM Nouri Maliki has condemned bombings in Baghdad that killed nearly 200 people - the worst day of violence since a US security operation began. Mr Maliki said those behind Wednesday's attacks were "soldiers of Satan". He also ordered the arrest of the army commander responsible for security in Sadriya district where some 140 people died in a car bombing in a food market. The attacks came as the prime minister said Iraqi forces would take control of security across Iraq by the year's end. "This monstrous attack... did not distinguish between the old and young, between men and women," Mr Maliki said. "It targeted the population in a way that reminds us of the massacres and genocide committed by the former dictatorship." US Defence Secretary Robert Gates said the attacks were "a horrifying thing," but said insurgents would not derail the security drive in Baghdad that began in February. The bomb in Shia-dominated Sadriya was reportedly left in a parked car and exploded at about 1600 (1200 GMT) in the middle of a crowd of workers and shoppers. More than 140 people were injured in the blast. The market was being rebuilt after it was destroyed by a bombing in February which killed more than 130 people. 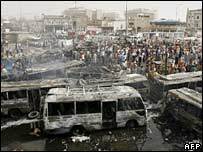 The powerful bomb started a fire which swept over cars and minibuses parked nearby, burning many people and sending a large plume of smoke over Baghdad. Television pictures showed a blasted scene littered with blackened and twisted wreckage. One witness told the Reuters news agency that many of the victims were women and children. "I saw dozens of dead bodies," the man said. "Some people were burned alive inside minibuses. Nobody could reach them after the explosion. Ahmed Hameed, a shopkeeper in the area said: "The street was transformed into a swimming pool of blood." About an hour earlier, a suicide car bomb attack on a police checkpoint in Sadr City killed 35 people. Several other attacks in Baghdad killed at least another 13 people. Car and suicide bombings have occurred almost daily in Baghdad in recent months, despite an ongoing US-led security crackdown. The bombers are proving that they can slip through the tightened security net, says the BBC's Jim Muir in Baghdad. Most of the attacks have been in Shia areas, increasing pressure for the Shia militias to step up their campaign of reprisal killings against the Sunni community in which the insurgents are based, says our correspondent. As Baghdad was rocked by explosions, security in Maysan province to the south was transferred from British to Iraqi control. Maysan is the fourth of the country's 18 provinces to be handed over to Iraqi security control. Iraq's national security adviser Mowaffak al-Rubaie said the three provinces of the autonomous Kurdish region would be next. "Then it will be province by province until we achieve [the complete transfer] before the end of the year," he said in a speech at the handover ceremony delivered on behalf of Prime Minister Maliki. On Monday, the Iraqi parliament bloc loyal to radical cleric Moqtada Sadr withdrew from the cabinet, demanding Mr Maliki set a timetable for a US troop withdrawal. But foreign troops are likely to remain in Iraq for some time. Analysts say that even if Iraqi forces take the lead in providing security across the country, they will need support from US and other coalition troops.